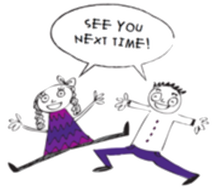 We don't know where the time went but............... parents / guardians are reminded that school finishes early (2:30pm) on the last day of term, next Friday 5th April 2019. Please make arrangements to collect your child / children early on this day. Please also be aware that there are only two school days in the first week of term two, Tuesday 23rd and Wednesday 24th April due to two public holidays and one pupil free day scheduled in the same week. Please make alternative arrangements for the care of your child / children on the pupil free day, Friday 26th April 2019. Mid Semester reports will be sent home with students on Friday 5th April. This ‘snapshot’ report gives you a brief yet accurate assessment of your child’s current performance against the achievement standards in English and Mathematics. We have continued to use the expansive set of work habits, attendance and punctuality on a five-point rating scale, similar to the more comprehensive report that will be sent home at the end of semester 1, in June. AVPS will be celebrating Cultural Diversity Week next week. This is an opportunity for the school to celebrate the depth and breadth of cultural backgrounds represented at the school. Our AVPS theme for the week is ‘We are one but we are many'’. The children will take part in art based activities on the morning of Friday 5th April. On this last day of term, Friday 5th April, all community members (children, parents, guardians, visitors and staff) are encouraged to attend AVPS in traditional dress or to dress in the colour orange, symbolising cultural diversity. Why orange? Traditionally, orange signifies social communication and meaningful conversations. It also relates to the freedom of ideas and encouragement of mutual respect. Do you have a story of cultural celebration to share? If so, please see your child’s teacher if you are willing and available to share your own story with your child's class to help celebrate Cultural Diversity Week at AVPS. For more information about Cultural Diversity Week in Victoria, please visit the Victorian Multicultural Commission website (click link). It would be helpful if you could bring along gardening gloves, sun glasses, sun hat, wheelbarrows, shovels, yard brooms, rakes. NB, the school does have limited supplies of these items - not enough for everyone though. Our new playground, which is looking fabulous, is scheduled to be inspected tomorrow, after which time (pending a positive report) it will be handed over to the children of Ascot Vale PS. Although we cannot promise, we are hopeful that this may occur during our working bee tomorrow. Cross your fingers, keep your eyes peeled on the fence and/or stay tuned for a PA announcement tomorrow. Tree maintenance and removal - Behind PE Shed, Bank St boundary near Unit 1 and near the hall front entrance. Nb, Unit 3 will be painted later in the year. Accordingly, Unit 1 will need to be cleared out on the last day of term, in preparation for refurbishing. Furniture will be stored in the unit 1 foyer, so this area will be out of bounds on the last day of term 1. Early this week, plumbers discovered a major issue with our sewer works, located on the Bank St boundary in front of unit 1. The issue has been rectified, however, we are making plans to have this area permanently fenced off from children and the general public to allow easier access in the future. In the mean time, this area will be taped off as an out of bounds space. As briefly outlined above, it is necessary to remove a large tree located on the Bank St boundary in front of Unit 1. This tree has recently been inspected by an arborist who reported it is hazardous and nearing the end of its life. This tree caused a serious trip hazard on the asphalt where a staff member recently received significant injuries after tripping and falling on the raised asphalt, caused by the tree root. Asphalt contractors reported that the tree roots must be removed before re surfacing this area. Coincidentally, this same tree has also significantly impacted the nearby sewer that was fixed by plumbers this week. Unit 4 & 5 have been impacted by staff needing to take personal leave. All replacement staff have been briefed and supported to ensure the planned teaching and learning programs have been implemented. We have received positive feedback from community members about improvements made to our communications in recent weeks, particularly regarding the introduction of Compass and Class Dojo. Thank you for this. Please be reminded that Compass is now our preferred method of communication and Class Dojo is being introduced across all classrooms over the first two terms of 2019. Some units have dojo fully functioning, others are yet to begin but we expect this program to be functioning across the school by the end of term 2. Regarding Compass, please contact Kylie in the school office if you have not received your welcome letter or if you need help logging on to the system. The school will be monitoring the uptake of Compass early next term in an effort to identify and support community members not yet signed up. Please find below some helpful tips to access the local permissions form and community calendar on Compass - under the heading 'COMPASS HINTS AND TIPS'. AVPS Parent Reps have traditionally sent weekly email alerts to families in their unit for the purpose of helping parents / guardians be better connected and informed about events or activities pertinent to their child and unit. Feedback has suggested these emails have been very helpful in connecting families to the school but at times have become quite long. In an effort to streamline our processes, Parent Rep communications will now be sent via a compass alert by our Business Manager Kylie Bonne on behalf of individual class reps. We anticipate that Kylie will send Unit alerts on Friday afternoons to help families prepare for the following week. AVPS admin staff are continuing to 'chip away' at updating our website (and learning how to do this). Our newsletters are now web based and office staff are learning more each week to enhance and streamline the way our news and information is presented to the community. For instance, we now have one 'school dates' page that will be updated on a fortnightly basis. A link to this page will now appear as the first item in the newsletter. Helpful hint: Please remember to click on the 'language' tab at the top left hand corner to change to the language of your choice for any of our web pages, including the newsletter. Please watch this space for helpful tools and tricks in using Compass effectively. 1. Sign your child's Local Excursion permission form (Only 40% of students have this signed). We have moved our first permission form to Compass. As mentioned in the last newsletter, to access: On the home page, under the My News feed (top right), click on the link under COURSE CONFIRMATION/SCHOOL PAYMENTS line in your feed - this should be at the top at the moment. From here, follow the prompts and complete the online permission form. What is local permission? From time to time during the year, units and/or groups of students will walk to local venues for excursions or as part of the sport/PE program. Parents will still receive a note that will inform them of the excursion and any costs involved but where the children walk to the excursion, permission will have already been sought. Local excursions are for walking only in the local or surrounding suburbs of Ascot Vale - they will never include using any type of transport. This permission is for the entire 2019 school year. 2. 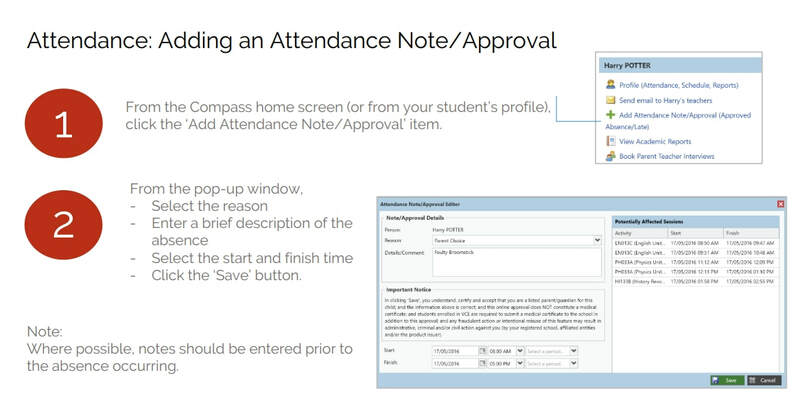 If you need to approve an absence in compass Follow the simple steps below. You can, and it's preferred, to fill in an absence if you know your child will be away for a future absence. 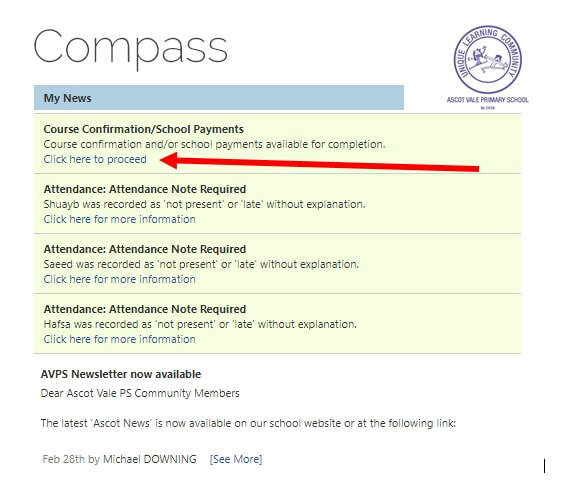 ​Please access the Compass guide for parents and families in the file below. Please find attached important advice for parents and teachers regarding the tragic events in Christchurch. It provides tips for talking with and helping children and young people cope after tragic events. We encourage you to read this advice to assist with the grieving and healing process if necessary. We are aware of at least two community members / families who have been directly impacted by these tragic events. Please contact the office if you or your child may need extra support following the recent event in Christchurch. With holidays fast approaching we ask our close neighbours or those using the playgrounds to help look after our school by reporting any suspicious behaviour in and around our school grounds to the police on ‘000’. Wishing everyone a fabulous holiday break (when it arrives). See you all back at school on TUESDAY 23RD APRIL. My name is Helen Millar and this is my 5th year on School Council and my 4th year of being School Council President. On Monday 25th March, school Councillors had our first meeting for 2019. * please note that Houda El Badwi has resigned from school council and Richard Moody has replaced her in a one year position for the duration of 2019. What is the role of School Council? School council's main role is to govern how closely AVPS follows its School Strategic Plan or SSP (a four year plan which outlines the strategic direction of the school). Our last SSP finished at the end of 2018. Our School Performance Report for 2018 was commendable and showed great improvement in academic performance as well as staff satisfaction levels. This is due to the successful implementation of HITS (High Impact Teaching Strategies) by our Staff and Learning Specialist, and investment in staff PD learning. In February this year, AVPS completed a School Review This took place over 3 days and included parent/teacher/student focus groups as well as Classroom Observations. The review panel comprised of myself, Sue Osborne, Michael Downing, 2 other Principals and Senior Educational Consultants. The report from this review will help define the foci of our next SSP. Other School Council Roles include approval of fundraising activities, policy development, monitoring school financial activities, approval of pupil free days, maintenance of the school premises, approval of camps, approval of hall hire and ensuring Child Safe Standards are being followed. The past few months have been an exciting and rewarding time for the Buildings and Grounds team as the Capital Works project started and is now almost finished. I think you'll agree the school has never looked better! It has been a very challenging time for AVPS staff and for our Principal, Sue Osborne as she has had to juggle: an acting assistant principal, a new portable classroom, portaloos!, a Pre-review School Evaluation, School Review, introduction of Compass as well as implementation of HITS and a new office Manager. I would like to thank her on behalf of the school community for her unwavering resilience during these difficult months. I look forward to meeting you in the school yard and hope to see many of you at our Annual Report Meeting which is on Monday 24th June. AVPS will be holding a Fete in term 4 this year and we need your help. Parents are invited to please come along to our first official Fete meeting for the year. WHEN: Thursday 4th April, 7:00pm WHERE: The Laurel Hotel, Cnr Mt Alexander Rd & Middle St, Ascot Vale. As a result of our capital works upgrade, AVPS has a large amount of excess furniture or miscellaneous items that need to be 're-housed , re-used or re-cycled'. We are very keen for these items NOT to end up as land fill, so please make us an offer or donation for any of the items appearing in the gallery below (click arrows to scroll). Items will be sold on a first come first served basis, most are available for immediate collection. Some items, such as the staff room and waiting room furniture will not be available until new furniture is delivered, in which case we will reserve the item/s for you. Please see Kylie or Christina in the office to purchase or reserve an item, or call them on 03 9370 6507 to 'make us an offer'. Please also contact us if you know of a charitable organisation that may benefit from unsold / excess items. Thank you. On Tuesday the 19th of March fifteen students were selected to go to the WESTERN METROPOLITAN REGION DIVISION SWIMMING CHAMPIONSHIPS, all students swam their best and did an amazing job. A huge congratulation to Lauren and Jordy from Unit 4, who have moved on to the next stage, watch out for these two in the 2024 Olympics! Thank you to the parents that were able to take all of the students to the Divisional, I appreciate your help. Last week we had our final session with Anthony ‘The Worlds Trickiest Tennis Coach’, the classes who were lucky enough to get a chance to work with him had an amazing time and enjoyed learning Tennis skills. Sadly, we say goodbye to Anthony but I know we will be working with him again! This week the Prep – Twos have been working on correct running technique and focusing on using their robot arms, to run as fast as possible. Prep – Twos will have ‘PE Mystery Homework’ coming their way next term so students get ready for it! This week is our last session with the SEDA Netball clinic, Students have enjoyed working in small groups and focusing on specific skills associated with netball. A big thank you to SEDA and next term we will have a different SEDA clinic in to help our students further develop their skills. On Friday 29th of March is the last Interschool Sports game for the 5/6s we have had a good season and I am so proud of our students amazing sportsmanship. Parents can you please wash your child’s purple sporting top and have them return it to me by next Friday. This ensures that there will be enough tops for everyone next term for our winter sports. A special congratulations to all students who nominated and presented speeches to their peers. Heath and Jason will share the role of SRC teacher leader this year. AVPS is accepting 2020 Year Prep /Foundation enrolments if Ascot Vale PS is the closest Victorian Government Primary School to your family's residential address. Please note, your child must turn 5 years of age by the end of April in the year they begin school. We encourage prospective families to attend one of our school tours to witness Ascot Vale PS in operation. These tours are scheduled to take place in term 2 2019 and are tailored mainly for families seeking to enrol their child/children in year prep / foundation for the 2020 school year. However, parents of older students wishing to transfer to AVPS in 2019 or 2020 are also welcome to attend. Please click on a link below to book into a school tour. Please click on the link / heading above to book a place at this information session, which is designed for new families enrolling children in year prep/foundation 2020 . However, families of older students wishing to transfer to AVPS in 2019 or 2020 are also welcome to attend. This information session will be held on Wednesday 5th June 2019 6:30-7:30pm in Unit 2. Please enter the school via the main building in Bank Street. Enrolment forms are available only from the AVPS office (NB not available on line ). These forms and other information will be distributed at the school tours and information session to eligible families. We request that parents/guardians please return enrolment forms and accompanying documents (if their child is due to begin in the 2020 school year) by Friday 28th June 2019 (last day term 2). This will help the school plan for staffing budgets and class structures for the following year. AVPS requests that parents, guardians, carers or visitors to our school who may be taking photos or videos (eg assembly, special events) please be mindful of their use of media, particularly when this may contain images of other students, either directly or in the background. Please be aware that there are a number of students who do not have permission for their image to be published online. Please also note, permission to publish is for the school only. We therefore request that parents, guardians, carers or visitors taking photos or videos be conscious that they do not have permission to publish images and ask that images of other students are NOT posted online, including social media sites. We have a number of students with allergies at Ascot Vale PS who require specific management. Some of these students also suffer from Anaphylaxis, which is a severe allergic reaction to a range of allergens. These reactions can be life threatening for some students. We therefore ask that all parents and caregivers DO NOT distribute food at any time without the direct permission of the regular classroom teacher. The MVIMP program is well underway and it seems all is smooth sailing. There have been some slight adjustments to our timetable, please note below. Please remind your child that they must be prepared for their lesson, i.e. have their instrument and music with them on the day. We now have a MVIMP notice board on the outside window of U5. We will endeavour to keep timetables up to date and add relevant information to this space. In the coming weeks we will be updating all of our contact details and we plan to keep you informed about make up lessons. Please be patient, nailing down musicians can be tricky work! Please be aware that we will be conducting a MVIMP instrument stock take on Monday 1st April 2019. Students are reminded to please bring instruments to school on this day even they are not scheduled for a lesson. Thanks for helping us keep track of our MVIMP assets. Please don’t hesitate to come and see us if you have any questions. Supervision IS provided from 8.45am before school at to 3.45pm after school. Students must not be left attended outside of these times. What does the no parking sign (in the drop off zone) mean? Drivers cannot park in the drop off zone during the times identified on the sign as this is only to be used as a pick up or drop off zone during those times. Vehicles are only allowed to stay in the drop off zone for two minutes. If you overstay this time limit, you may receive a parking infringement. IN PARTICULAR - PLEASE NOTE – The Bank Street car park and lane way MUST NOT be used as a drop off zone or for completing U turns as this is a DANGEROUS manoeuvre around small children. We strongly encourage parents and carers to please follow the requests above in order to keep everyone safe, particularly our children. Online​​. To order online, use the PSW website, ​www.psw.com.au and follow the prompts. First Tuesday of the month from 3:00-4:00pm. All Donations welcome. Please deliver to school office. Thank you to Nicole Harvey (mother of Olivia & Elizabeth) who is the volunteer co-ordinator of our second hand uniform store. Please note - there is currently a lot of winter stock available, please contact Nicole to prepare for the colder months ahead. Please access files below to view the OSHC fortnightly report and/or the Camp Australia Holiday Program. This program has been operating for 30+ years and is managed in conjunction with: Ascot Vale West PS, Moonee Ponds PS, Moonee Ponds West PS.